This concise and very easy-to-use primer introduces readers to a host of computational tools useful for making sense out of data, whether that data come from the social, behavioral, or natural sciences. The book places great emphasis on both data analysis and drawing conclusions from empirical observations. It also provides formulas where needed in many places, while always remaining focused on concepts rather than mathematical abstraction. • Make use of computational tools used by data analysis professionals. Assuming only minimal, prior knowledge of statistics, SPSS Data Analysis for Univariate, Bivariate, and Multivariate Statistics is an excellent “how-to” book for undergraduate and graduate students alike. 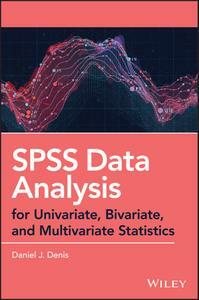 This book is also a welcome resource for researchers and professionals who require a quick, go-to source for performing essential statistical analyses and data management tasks.